The way all-time great Manny Pacquiao tells it, he’s not even close to hanging up the gloves. Despite the fact that he will turn 40 this year, in December, and despite the fact that he has been a pro fighter for almost a quarter of a century, the multi-weight king insists he both feels, and is better, than ever. Speaking with Jamil Santos of GMA News, Pac Man said he “feels like a 27, 28 year old” and that we fight fans can “expect more fights to come” from him. 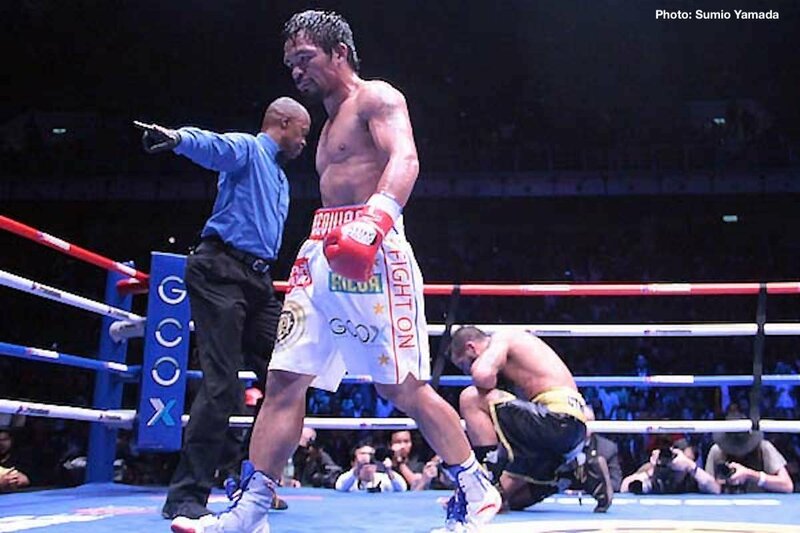 As fans know, Pacquiao picked up yet another “world” title with his recent, career-invigorating stoppage win over Lucas Matthysse to also pick up his first KO win in almost a full decade. But those people who felt that would have been a perfect and ideal time for the future Hall of Famer to call it a day and retire from boxing to become a full-time politician can think again. Manny revealed the secret to his fountain of youth: happiness, and being happy. Pacquiao is in a good place right now. But will this remain the case if he fights on for, say, three or four more bouts? Just who Manny may or may not fight next is currently being discussed by all – his fans, his team and his promoter Bob Arum (who will meet up with Pac Man soon, to “say hello” – as well as to no doubt plot the southpaw dynamo’s next fight). But at his current age, as great as he is and as fresh and as revived as he looked against Matthysse, Pacquiao will be pushing his luck with each and every fight he has from here in in. Father Times catches up with ALL fighters in the end (just ask Bernard Hopkins, the man that held the old guy at arm’s length for the longest time before succumbing) and it’s rarely a pleasant sight seeing a great warrior’s final ring battle. Pacquiao might be good for another win, or two, or maybe even three, if he’s matched realistically (forget Lomachenko and forget Crawford) – but the end cannot be too far away. Let’s all hope Manny Pacquiao can smile when his incredible fighting career does finally come to a halt.